Mohamed Salah got his name on the scoresheet yet again this afternoon, as the Egyptian winger fired home just after half time to make it 3-0 Liverpool in their clash vs Bournemouth. 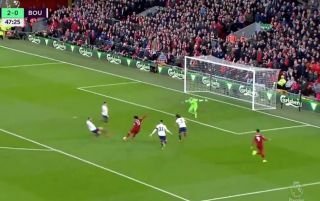 Salah, who’s been on fire so far this season, got in on the act just after the break this afternoon, firing home following a brilliant back-heel assist from Firmino. The goal now means Liverpool will surely be taking home all three points from their clash against the Cherries this afternoon, and going top of the league as a result!